When in 2017 NZ Post didn't issue the annual Matariki stamp issue, I was a bit disappointed as I've come to enjoy each Matariki issue for their interesting and colourful stamps. I understand why they did this because two other Maori related issues were released that year. See 2017 He Tohu and 2017 Te Reo Maori - Maori Language. We don't want too much of a good thing, do we? In the absence of a Matariki issue, I have decided to add my own Matariki post looking at Matariki and some of the legends behind it. When I started this I was looking for a great page of stamps but I could only find two stamps that actually showed Matariki / The Pleiades, so I had to settle on a post using just these two stamps. Matariki is the Maori name for a star cluster that becomes a highlight of the night sky over the warmer summer nights. Traditionally it is known as the "Seven Sisters" or by the Greek name "Pleiades." According to Greek mythology, the Pleiades are the seven daughters of Pleione and Atlas – Electra, Maia, Taygete, Alcyone, Celaeno, Asterope and Merope. A number of ancient temples on Athens’ Acropolis face the direction where the Pleiades rise. Many cultures and languages name this star cluster, such as Japan where it is called "Subaru" meaning gathering together. Yes, the famous brand of Japanese car gets its name from this and wears a badge featuring these seven stars. For a very detailed list of how Matariki features in cultures worldwide, I refer you to Rangi Matamua's book "Matariki - The Star of the Year." The Pleiades or Messier 45 (M45) is generally known as an open star cluster, meaning the stars are loosely grouped rather than tightly packed as in some star clusters. Seven stars can usually be seen with the naked eye, even nine on a clear, dark night but binoculars or a small telescope will reveal several hundred stars, all related and grouped together. 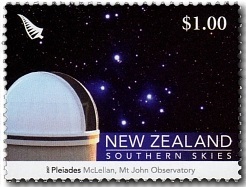 $1.00 Pleides from Mt John Observatory. 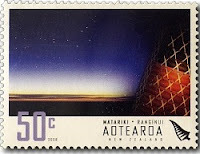 In some ways, this stamp could be considered as a forerunner of NZ Posts Matariki series which has provided us with a Maori themed stamp issue since 2008. Different iwi has different versions of the Matariki story. Some are almost the same and some vary greatly. By presenting different versions here it is not my intention to laugh or make fun of Maori culture in any way. Science and astronomy may tell us otherwise but to the people who told these stories, handing them from generation to generation, they were truth. Truth, in that they explained things that could not be explained. Truth, in the knowledge that those among the stars were looking out for and helping, the people on the earth. Truth, in newness and hope as the yearly life cycle, begins all over again. Te ARA - The Encyclopedia of New Zealand. Matariki literally means the ‘eyes of god’ (mata ariki) or ‘little eyes’ (mata riki). Some say that when Ranginui, the sky father, and Papatūānuku, the earth mother were separated by their offspring, the god of the winds, Tāwhirimātea, became angry, tearing out his eyes and hurling them into the heavens. 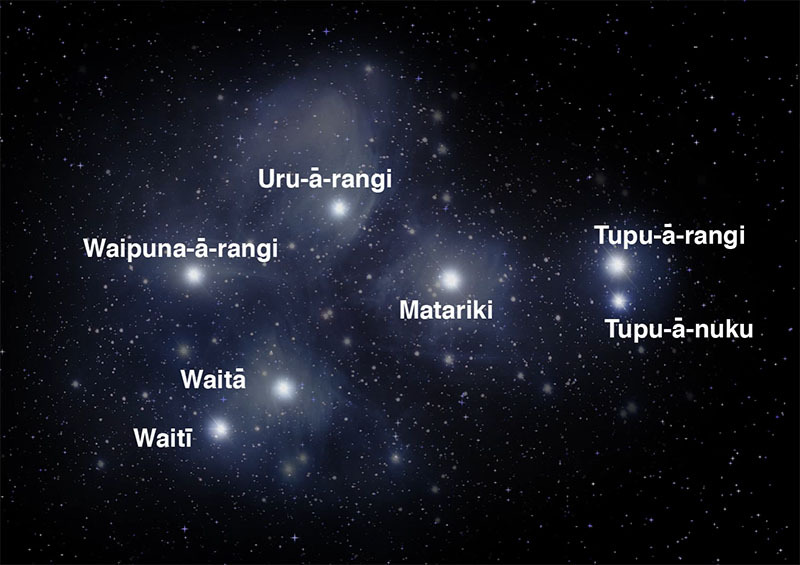 Others say Matariki is the mother surrounded by her six daughters, Tupu-ā-nuku, Tupu-ā-rangi, Waitī, Waitā, Waipuna-ā-rangi and Ururangi. One account explains that Matariki and her daughters appear to assist the sun, Te Rā, whose winter journey from the north has left him weakened. Matariki and the six sisters - Te ono o Matariki. From the Te Papa website. There are many legends about the star cluster Matariki. One of the most popular is that the star Matariki is the whaea (mother), surrounded by her six daughters, tamariki (children), Tupu-ā-nuku, Tupu-ā-rangi, Waipunarangi, Waitī and Waitā, and Ururangi. During this visit, each of the stars helps Papatūānuku to prepare for the year to come, using their unique qualities or gifts to bring mauri (life force or energy) to her different environments. Whilst spending time with their kuia (grandmother), they also learn new skills and gain new knowledge from her, which they guard and pass on to others. Tupu-ā-nuku is the eldest of Matariki’s daughters. She spends her time with Papatūānuku tending to plants. She pays special attention to making sure they have everything they need to grow big and strong so they can produce kai (food), rongoā (medicine), and kākahu (clothing materials). When we see her shining we are reminded that we all have our own special time and place, and to spend time growing our pūkenga (strengths), as well as that of our friends. (the great forests), and all the children of Tānemahuta. Her beautiful voice revives the forest and all the other creatures, including the manu (birds), and mokomoko (lizards). They share their waiata (song), which fills the world with joy. Tupu-ā-rangi learns these songs and holds them close to her heart. We learn from her the importance of sharing our gifts with others and appreciating those shared with us. Waipunarangi accompanies her grandmother to the waters – the oceans, lakes and rivers – where she prepares the children of Tangaroa (god of the sea), to feed the people. Papatūānuku also teaches her about how the water that spills down from Ranginui (the sky father), collects together to provide drinking water for the people, animals and plants. She also watches how the water is evaporated by the heat of Tama-nui-te-rā (the sun), into the clouds that cloak Ranginui, so that may rain once again come. When insects work together, they can they can do amazing things. Ngā pī (bees), for example, pollinate all the flowers so that the plants grow, and we have air to breathe. Ngā pōpokoriki (ants), build huge, complicated tunnel cities underneath the ground, and carry many times their body weight. Ururangi enjoys racing all of her sisters to get to her kuia first. She claims the best spot on her grandmother’s lap and wraps herself in her arms, settling in for her favourite stories. Her tenacity and excitement, along with the awhi (hug) and her aroha (love), helps Papa to get into the right mood after the cold and darkness of takurua (winter), to prepare with her older mokopuna (grandchildren). But what about Matariki you may ask? Well, she's doing what all good mothers (and other caregivers) do – watching over and helping out her tamariki (children). With her support, encouragement, and supervision, they will be able to do their very best. Matariki and her six daughters. Matariki and her Eight Children. From 'Matariki - The Star of The Year' by Rangi Matamua. For Maori, this star group is called Matariki, and its arrival on the dawn horizon heralds the start of a brand new year and time of celebration. You could say its a sign of renewal, a sign of new beginnings. While different iwi have different versions, generally the stars of Matariki are seen as a family, sometimes seven or sometimes nine stars, with the mother called Matariki, guiding her eight children across the sky. The children, six females and two males, (yes two males in this version), each have a part to play in Maori life being connected to different aspects of everyday things. Waipunarangi (water that pools in the sky) is connected to the rain. Ururangi (the winds of the sky) is connected to the winds. Hiwaiterangi (vigorous growth) connected to the promise of a prosperous growing season. Pohutukawa, the most sacred of these stars is connected with the dead. Tupuarangi and Tupuanuku are associated with the male and female aspects of growing/gathering food of the land. Waiti and Waita are also linked to food and water, more correctly, with food that comes from rivers or the sea. Notice both names start with 'wia' meaning water, one being male and the other female, said to be twins. Photo of Matariki/Pleides showing both the Maori & Greek names for the nine brightest stars. The separation of Ranginiu and Papatuanuku. The stories of Matariki are closely related to this creation stories so I've included it here. The first stamp of the first issue in the Matariki Series depicts the seven stars of Matariki in the sky domain of Ranginui. It is said that in the beginning Ranginui (Sky Father) and Papatūānuku (Earth Mother) were in a close embrace, with their children in the darkness between them – but their children decided they must separate their parents to illuminate the space between in which they lived. Tāne, the god of forests and birds, placed his feet against the breast of Ranginui and forced him into the heavens, leaving Papatūānuku as the Earth below, the foundation of life and all human activity. The children were horrified when they saw the pain they had caused their parents, but what was done could not be undone and so remains like that until today. The rain is Ranginiu's tears for his loved one and the raising mist Papatuanuku weeping in return. Where do we find Matariki? In Aotearoa, (New Zealand), Matariki (The Pleiades) is visible for most of the year except for a month or so when it disappears behind the sun. It appears in the dawn sky late June / early July and is visible until it sets in the early evenings of May. It is located in the constellation of Taurus the bull. The best way to find Matariki is to look for the Belt of Orion, known as the "pot" or "Tautoru" to Maori. The constellation Orion the Great Hunter has three stars that mark his belt. Nowhere else in the night sky is there three stars of this brightness in a line like this. You can confirm this by finding a line of three fainter stars that mark his hunting knife, above to the right. Now follow the line of the belt towards the left and you will come upon a triangular shaped cluster of stars known as Hyades or the face of the Taurus the Bull. Maori called this Te Kokota or Mata Kaheru. Continuing further to the left you will notice another small group of stars clustered close together. 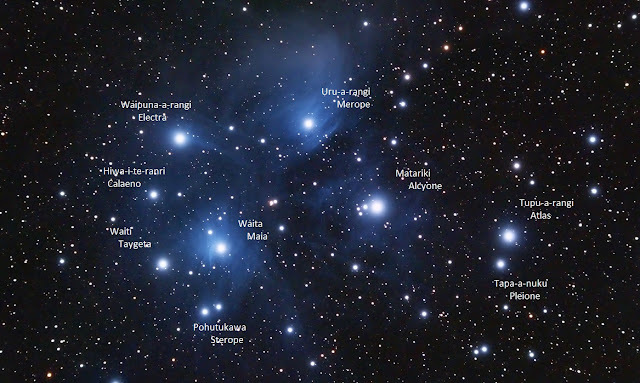 This is The Pleiades or Matariki. At this point, I often relate the story to those with me, how Orion the Great Hunter, with his two dogs Canis Major and Canis Minor, are hunting the great bull Taurus to save The Seven Sisters. I've heard this put another way that Taurus the Bull is saving the Seven Sisters from Orion's evil intentions. Personally, I like to think of Orion as being the good guy. Special thanks of our good friend Moa (Real name withheld). Go visit our full Matariki Collection. A lot of information concerning two stamps but I understand how you have taken a lack of a 2017 Matariki issue to give us a general backgound issue. I see you've tied it into your main Matariki page too. While it is interesting, I do not think it is as successful as many of your posts Allan. Yes, its a keeper but not one of your best. Moa, I think you were a bit hard on Allan. This is a good post in that it achieves what it sets out to do. had already set so went out earlier the next night. Orion I knew so it was easy to trace a line down closer to the horizon where we found Matariki. Binoculars showed it better but to was too low for a good view. Next year we will take a look again. One of Allan's fan club. I think you are missing my point above. The post is good but I believe more could be done with it. I think we are going to give it a makeover next time I am down there. That sky map with the star names was a good addition. I could follow and find each of the stars mentioned in the notes.